Solander Pacific makes use of Orbmap from Geoeye to identify possible areas of fish concentration. With fuel costs now exceeding 50% of operating revenues it is essential to find fish fast. Current Diesel prices (around $USD1350 MT – and rising daily) have made surface long line operation in the Pacific Ocean uneconomic. Unfortunately fish prices today are significantly lower in real terms than any point in the last ten years. Unless there is a sudden and significant increase in Tuna prices especially Albacore, the people of the Pacific are about to be forced into leaving one of their most valuable sustainable natural resources in the sea. In terms of protein production wild fish “farming” via the long line method especially, is one of the world’s most environmentally friendly methods of protein production. 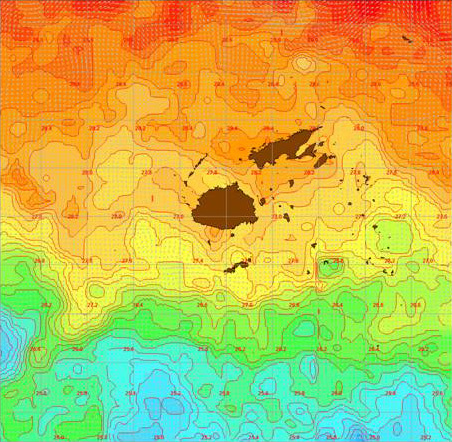 Picture shows current sea surface temperatures within the Fijian EEZ.